If you have an Apple watch, then you probably want to do your best to protect it! We often protect our smartphones, but we need to take an extra level of precaution when it involves our watches. We often scrape and ding our watches with the slightest of movements, and Apple watches aren’t exactly scratch-proof. With that being said, adding a screen protector is essential if you want yours to be in pristine shape! So, which is the best screen protector for you? Well, that’s what we’re here for! Now that you’ve taken a general look at each of the best Apple watch screen protectors, why don’t you scroll down even further to read in-depth about each product you have your eye on! It’s important to make an educated decision, so you receive exactly what you’re looking for and don’t risk damaging your watch! Wearing your watch without worrying that it can be scratched is so nice. Since this guide is about watch, take time to read our other guide about the best smartwatch under 50 USD. The Apple watch protector from ArmorSuit consistently makes the top of the best watch protector reviews, for many good reasons! 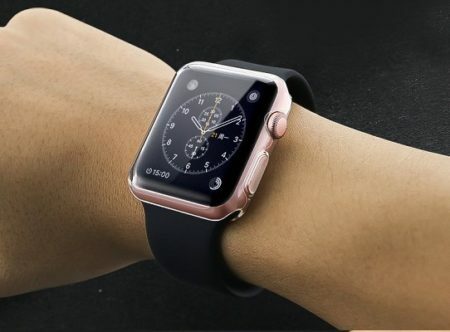 First of all, it is made with “MilitaryShield”, which is a maximum-coverage screen protector that is designed to withstand the troubles that come many Apple watches’ way! We know how frustrating it can typically be to apply these kinds of screen protectors, as it involves putting it on incorrectly, being off-center, not sticking, creating bubbles, and more! With the Armorsuit protector, you no longer have to deal with that. MilitaryShield uses a unique type of wet installation method which eliminates the chance of bubbles appearing under the surface. Any small bubbles that may pop up will disappear in just 24 hours, so don’t freak out if little ones are there initially! The self-healing technology is also included in this amazing film, to ensure that any minor scratches or bumps never even make an appearance! This technology is included in few others; most that you’ll see on the market today may protect the actual screen, but you’ll still see the scratches in the film, itself, which can obstruct perfect viewing. The application method is through the wet installation which makes the process easy and mistake-proof. However, know that small adjustments and alignments can be made easily to match the fit and cutouts. The flexible film is a bit unique as well, as most others are stiff, and make it hard to follow every contour well as ensuring the corners stay on perfectly. The flexible film follows the contours and curved edges of your watch. So well, in fact, that you may forget It’s even there! Many people have stories about using a screen protector for the Apple watch, only to find out that the touch responsiveness is “off” or just doesn’t work as well. The smooth surface of this cover creates minimal friction so as to never interfere with the responsiveness of your touch. 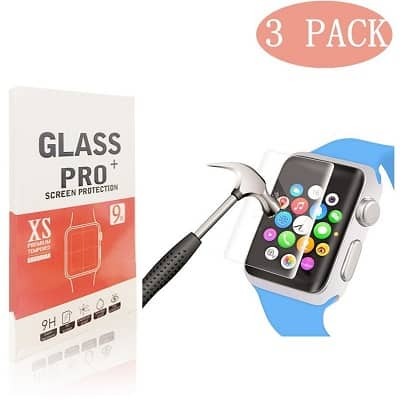 You may be wondering about this Apple watch screen protector and how well it fits your device; and understandably so! Once yours arrives, you’ll find that it’s designed for the perfect for your Apple watch. They feature exact cutouts, specifically to add to the ideal fit as well as maximum protection. Keep in mind that it won’t be compatible with every single case. With UV protection, no yellowing will occur, providing supreme ultra HD clarity rarely found in Apple watch screen protectors. In fact, they’re practically invisible once applied! We all know how annoying fingerprints can be on our devices; which is why they’ve added on a layer of fingerprint reduction in the film to help keep it clear and looking perfect. Next up is a kind of screen protector case for the Apple watch from the company, Julk. Not only does it provide additional protection for your screen face, but the watch case as well!. Something that we really enjoyed about this Apple watch screen protector was the fact that you can’t really apply it wrong, unlike the screen applicators, which you often have to deal with bubbles or misapplications. It also features a complete, 360-degree full protection. The way this case works is that it fits right in the face of the watch to protect the screen and the sides. However, It’s made of a very thin material to ensure that the touch sensitivity is just as it would be without the screen protector. It honestly fits like a glove, at just 0.3mm, and is designed to mimic the Apple watch design. The protector itself is made of crystal-clear TPU, ensuring the images on your screen are always to the level of brilliance and sharpness they should be. We also liked the fact that it was removable, just in case you need or want to take it off for whatever reason. First off, is the fact that it does not stick to the screen. This is more of a personal preference than a “downside”, but regardless, we’ll throw that in there. 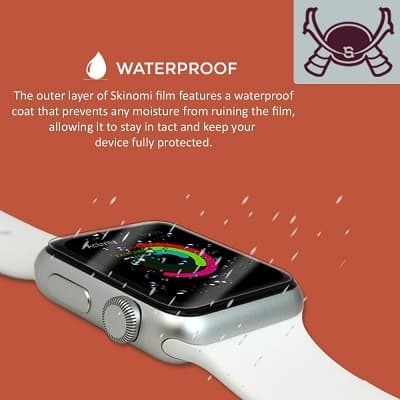 In the same token, if you’re using your watch at the gym or in an activity where you may be sweating or there may be rain, let’s say, moisture can get trapped between this protector and the actual screen, itself. In addition, it does work with the Series 2 watches, as well, but keep in mind it does partially cover the speaker and mic on that model! As one of the best budget products out there today, the Linboll high-quality screen protector is definitely one of the best Apple watch screen protectors we found currently on the market. Made of high-quality, multi-layered TPU with self-healing technology, you’ll find out what a great product on a budget is all about. Most products at this price range are simply sub-par, and many users often find themselves unsatisfied. Not with the Linboll 3-pack. Oh yeah, did we mention it comes with three of everything in the package? Three pack screen protectors, dust absorbers, guider stickers, scraping film pieces, packs of alcohol, and three wipes. With that being said, it would be a great price for just one, but it includes enough for three different users/watches! The molded screen protector for the Apple watch is well-molded, to ensure your screen is perfectly protected while fitting like it should. It is flexible enough to form with the natural curves of the watch, where the more firm, plastic models cannot. It’s extremely thin, so as to ensure the touch responsiveness operates as it should, while still providing the natural feel, much like the actual screen of the watch has. Not only that, but it is fingerprint-proof, to make sure your screen’s display is always looking it’s best, without obstructing any part of it. The only thing we weren’t fans of, was the fact that while the four corners are all smooth, round edges, the high cutout area around the button also has a high edge, which you feel each time you press the button. Aside from being slightly annoying, dust and dirt also have the tendency to accumulate here. Now, the Spigen Rugged Resilient Apple watch screen protector is a little different than the others on our list today, as you’ve probably already noticed. It doesn’t solely cover the screen, but rather, acts as a case. However, due to the way this protector was designed, we found that it actually also works really well in protecting the screen of the watch, as well, due to the heavy-duty construction and raised design. If you have a very active lifestyle or job, then we recommend this one for you. To “install”, all you have to do is slip the band through the right holes at first, making sure you don’t slip it in all the way. Then, just slip the rest of the case on from the sides, and it fits perfectly. Since it is “rugged”, you may be wondering if it’s bulky. The answer is, not at all! Of course, there is going to be some difference, but it’s not going to make it notably thicker or heavier. Now, we want to make sure that you know it’s not only a case, but also comes with two screen protectors, as well! This was also one of our favorites, but didn’t make the editor’s favorite, as it was not just a screen protector. This protector and case combo works with the 38mm and 42 mm Apple watches, series 1 and 2, so make sure beforehand that you’re buying something that’s going to be compatible with your device! While looks aren’t everything, this case is definitely quite rugged and solid. If you’re into more dainty, “pretty” accessories, then you may just want to go with something more sleek. We also marked this as one, if not the most durable product on our list. Made of solid TPU, it isn’t just going to fall apart or break because you drop it or bump it up against something. They’re made to be put through the ringer and make sure your watch stays protected, always. Despite being so sturdy, it’s still flexible, and can be easily taken off and put back on. In addition, you can tell that the case really was designed specifically for your watch, with the precise cutouts for quick accessibility, and the flawless fit that mirrors the design of the watch. First of all, we found it important to note that this Apple watch case and screen protector does not sit tightly against the watch. This means that all kinds of dust and debris can get stuck in-between the case and your device. The good thing is, that as we said previously, it is easily removable. Second, some of you may just be looking for a case, and some, just for the screen protector. If that’s the “case”, then you may be better off with another product. However, we found that at such a great price, may as well just get both products! 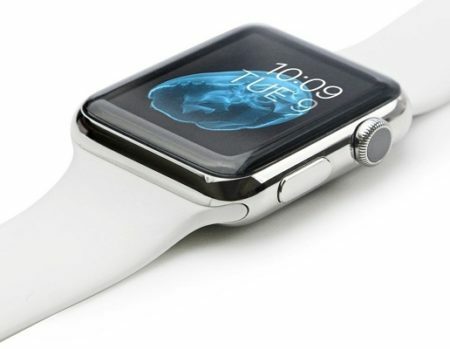 Are you on a budget but still want to protect your screen of your Apple watch properly? The Skinomi Techskin 42mm screen protector has got you both covered! Thanks to the very specific design, it provides complete screen coverage, so you don’t have to worry about it missing the edges or being too big for the screen. The durable, yet flexible material also conforms to the shape of your watch; even if It’s a curved device! Made of self-healing, flexible, tough, military-grade thermoplastic urethane, It’s designed to absorb impact. Not only that, but it’s resistant to scratches, punctures, UV light, and will not yellow. That means that you’ll always have the best, HD display. As far as installation goes, it’s pretty straightforward, as well as error-proof, and with anti-bubble installation. The liquid solution it comes with allows for adjustments during installation. Specifically, to reduce dust, oil, as well as fingerprint smudges which we all know can easily mar the clear display Apple watches are known for. There are so many other screen protectors out there that may seem like a good idea, but you’ll find that within a few months, you’ll just have to replace them again. 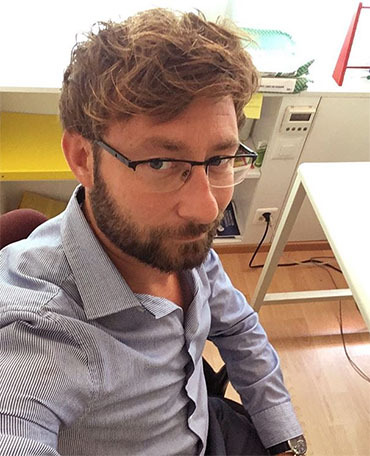 That’s why Skinomi has created a screen that is so reliable and durable, to give that “fresh out of the box” look, always. Oh, and did we mention that this pack comes with a whopping six protectors? You can buy a pack for the entire family, or just ensure that you always have a few replacements, just in case you need them! The Luvvitt Apple Watch Case and Built-In Screen Protector made our editor’s pick for multiple reasons; we found that there really wasn’t a screen protector better than this! 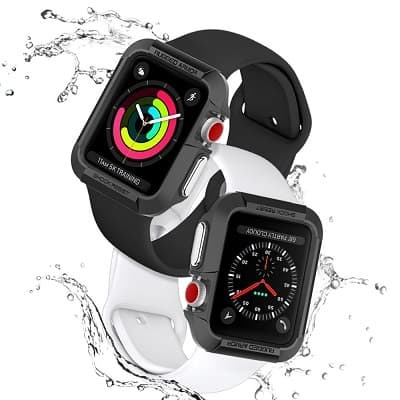 If you truly want your Apple watch to look exactly how it did the moment you first opened the box, then check this one out! The snap-on case and screen protector is the easiest of all of the products to put on, as it takes seconds, and you’re all set! The case covers the entire front, including the screen. Made of the highest-quality, premium, hard, polycarbonate, the case is crystal-clear, durable, and made to last. You can take it to the gym, or a sports game and not have to worry about bumps and scratches! Despite being so durable, it’s actually ultra-slim in its design: clocking in at just 0.4mm! It fits like a glove and perfectly mimics the Apple watch’s design. Something else that is worth noting, is that not only are the most premium materials used with Luvvitt, but their customer support is also impeccable. First of all, if you’re doing high-energy activities, perspiration can cause moisture to get trapped between the protector and device. Luckily, it does not stick to the screen, and it’s easy to remove. In addition, it’s the most expensive item on the list; but, we feel it’s worth it. When it comes to choosing the best Apple watch screen protector, it can be hard selecting one that is truly worth it. That’s why we’re here to provide an unbiased review to ensure that you’re selecting the best protector for you, and to make sure the screen of your device remains in the best possible state. The buying guide below will also help you to easily make the best purchasing decision by going through each category and making sure you’re buying exactly what you need! We all know that sense of dread when we think about applying a screen protector to our devices. Most of the products unfortunately require the most precise, stable hands to apply them, and allow no room for error or result in bubbles under the protector. We made sure that all of the products we’ve included are not that complicated; because it shouldn’t be. While not every product on our list has the same application process, they are all relatively simple. However, some require more patience than others, and some take literally seconds to snap on or slip on. If this is important to you, then take this into consideration. Price is usually important to some extent, even if you aren’t necessarily on a budget. 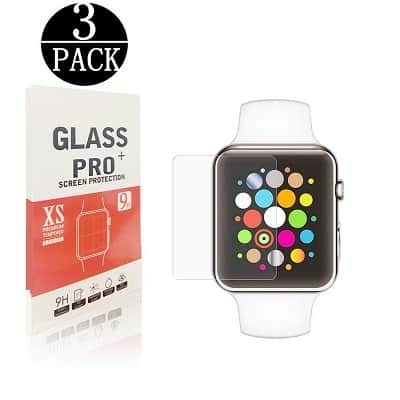 Most Apple watch screen protectors are relatively inexpensive, however, not all of them. In fact, our favorite was the most expensive by far. Normally, we don’t select the most expensive product because we’ve found products comparable at a much lower price. However, in this case, this one was really something special. Most screen protectors on the market today are nothing more than a clear, little sticker. They fall off quickly, they may hardly even stick to your device. They’re not something we recommend for our readers. However, each of the products on our list is durable, in comparison. Some of them come with more than one protector, which will help in terms of durability, as you always have a backup. However, there are others that are even more solid, and work as a case as well. Now that you have (hopefully) a solid understanding of the best Apple watch screen protectors on the market today, we hope that you’ve already selected one to arrive at your doorstep! However, if you haven’t, then let us reiterate our personal favorites. First of all, is the Spigen Rugged Resilient case/screen protector. It is made of a durable TPU which is flexible, yet very durable. It is designed to absorb shock and protect your watch from all the drops and bumps it may run into. 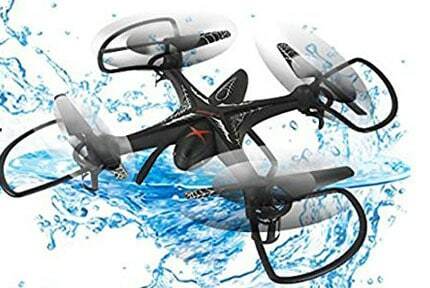 It’s easy to take off and put on, which is nice in terms of convenience, or if some dirt or debris gets stuck. It also comes with two screen protectors, so you get all-around protection; not just the watch exterior, but the face of the watch. The second product, which was our overall favorite, was the Luvvitt case. 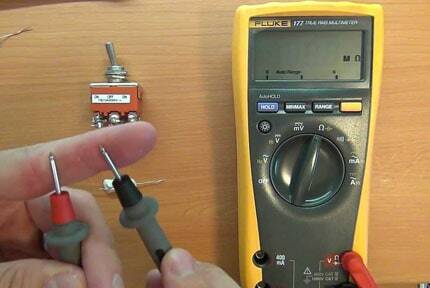 It is a unique snap-on design which takes seconds (if that) to remove and put back on. This makes it easy if moisture from perspiration gets trapped between the surface of the protector and your device. 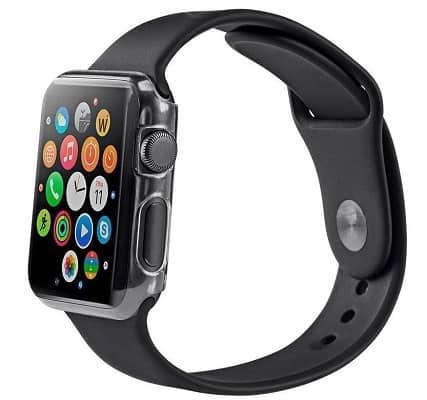 It’s made of super-durable polycarbonate, which is also flexible and perfectly mimics the Apple watch’s design. It functions as a screen protector and a case, which is awesome, too! Now that you have options on what to buy, take time to read our guide on how to hook up your cable to TV. This guide might help you!